So I was going to do my e.l.f. Cosmetics review today, but I recently popped by their website and discovered that they are having a MAHUSIVE fall sale and I just couldn't say no to it. So I'll be doing that review/haul when I get everything in and I'm just so excited for it! If you need a couple of extra things, I would have a visit to e.l.f. and get as much as you can. It's buy one get one free and what's better than that? Some of you may know by now that I get an Ipsy bag every month. It typically contains 5 different beauty and skincare products in a cute little makeup bag. This month was called Beauty Candy. I've already reviewed the Revlon mascara, which you can find here. So far it's my favorite from the bag. They included facial wipes, a lipstick (which I have included in my FOTD, here) body butter, a skin cream, and of course, the mascara. This is a very thick body butter for dry and irritated skin. It's perfect for this time of the year, especially for me, as my skin does tend to get very confused with the changing of the seasons and freaks out a little. It has jasmine, lavender, and patchouli, so the smell is a little strong when you open the container. Don't let that throw you off though. It leaves a very faint fragrance on your skin and leaves it feeling smooth. I received the 1 oz bottle, but you can buy a 6.75 oz from their website. This is a non-greasy and lightweight moisturizer. It's a blue and gel like and feels great when you put it on your face. I have to admit, I've only used it once since getting it but oh my, did it make my skin feel new! My next experiment is to try it on my lips, as they can get quite chapped and dry in the winter months and I've read that this is the perfect solution. It's also great for sunburns, so stock up on it for the summer! After I had mentioned in my Let's Talk About: Reds post that I needed lipstick for autumn and winter, I got this. According to the website, they use all natural ingredients for their lippies and they're supposed to go on smooth. And they do! This stick had just a little bit of shine to it and I found myself applying a gloss over it throughout the day, but I don't have too many complaints on this product. It's not incredibly pigmented, but I found that a safe route to take, since I'm still experimenting with sticks. This is a good choice for someone still taking strides in their lip journey! These cloths are meant to make the end of your day easier. You just rub the cloth and suds come to, making it easy to remove your makeup and anything else that might be stuck to your face. This is not meant to be your entire skincare routine, so please don't forget to use you daily washers! You don't need water for these, but I would recommend it. I'm going to say, I'm not a big fan of these. It left my skin feeling sticky and the smell was not that pleasant. It has cucumber and coconut in it, but all you can smell is some kind of chemical, I can't even describe it. I'm thinking these would be good for an after workout cleanser, but I would definitely follow it up with your regular skincare routine. Would you get any of these products? 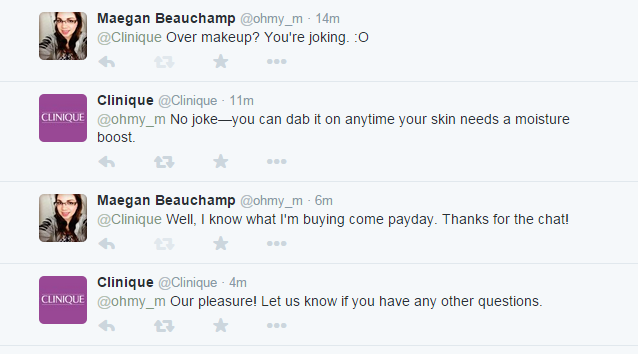 I recently had a quick chat with Clinique on Twitter today! So after searching around online for a good price, I found this at Sephora's website! It's a beautiful looking gift set with all, if not most, of Clinique's Moisture Surge products! And it's only $49.50. Christmas may come a little early this year. 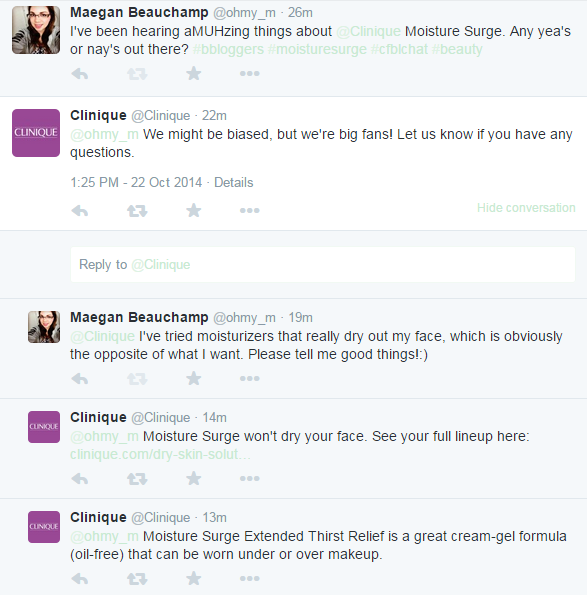 Have you tried Clinique's Moisture Surge? I think it's really funny how you can be looking for something, buy a cheap version to hold yourself over, and then something like this will just come right to your front door! I have an ipsy glam bag delivered to my door every month and there's around five things that they send you, varying in value. I had been looking for a new mascara, and low and behold, they sent me one. The container is thin and almost holographic-ly designed. I was expecting the brush to be a bit smaller given the size of the bottle, but I was not disappointed. To hold myself over from buying a brand new container of mascara, I purchased a $3 E.L.F mascara that seemed to work okay for the time being. I had used it maybe two days before this came. The E.L.F mascara got EVERYWHERE. Don't get me wrong, I love the brand and the mascara did it's job for the most part, but really the only thing I noticed it doing was clumping my eyelashes together. Not quite the desired effect. I really do feel like my eyelashes look longer. It dried quickly and hasn't gone anywhere except the intended location so I'd have to give this a 9 out of 10! Which mascaras have you been loving? Soap & Glory Heel Genius | Usually, when it comes to creams for the feet, I stay pretty standard. Aveeno all the way, amiright? However, as I've been loving Soap & Glory as a brand lately, I thought I'd try this out. When the green tinted lotion came out, I will admit, I was surprised. But despite the fact I thought it would be white like most lotions, it smelt decent and it has worked marvelously on my feet. If you're having dry skin, especially since the months are getting colder, I would very much recommend this. Briogeo Don't Despair, Repair Deep Conditioning Mask | This was sent to me in an Ipsy bag, so I didn't pay the $26 for it. I'm not sure if it comes in any other size, but I hope it does because the one I have is like a sample size. I've only used it twice but it makes my hair feels incredibly silky smooth and soft after using it. I can't say if I will buy it once I've run out, but if you need your hair repaired a little, whether it's dry or just damaged, I would recommend this. My split ends have been disappearing since using this product. VS Angel Gold Fragrance Mist | I've recently dug this out of my collection of long forgotten scents and it's something I've been loving recently. I tend to buy new scents before I've finished any, so I end up with an abundance of them. This particular has a citrus-y, blossom scent to it. The website describes it as fruity floral and it lists all the undertones as well. I've worn it almost everyday this month as it's a-MUH-zing! Simple Revitalizing Eye Roll-On | Typically, I only use this in the morning and at night before bed. It's really helped the puffiness under my eyes since they are always irritated in the morning. Since it works so well, I've taken to using it in the afternoons on my make-up free days and it leaves the skin there feeling so refreshed. What did you love in September? Since it's autumn (which I'm absolutely loving) red is a color you see everywhere. Not to mention when Christmas comes around, you might actually get sick of it a little. I've really never gotten into red myself. It's such a bold color that I tend to stay away from it, but I'm working myself to it slowly. There are two things here that I used to use all the time when my hair was neon orange. 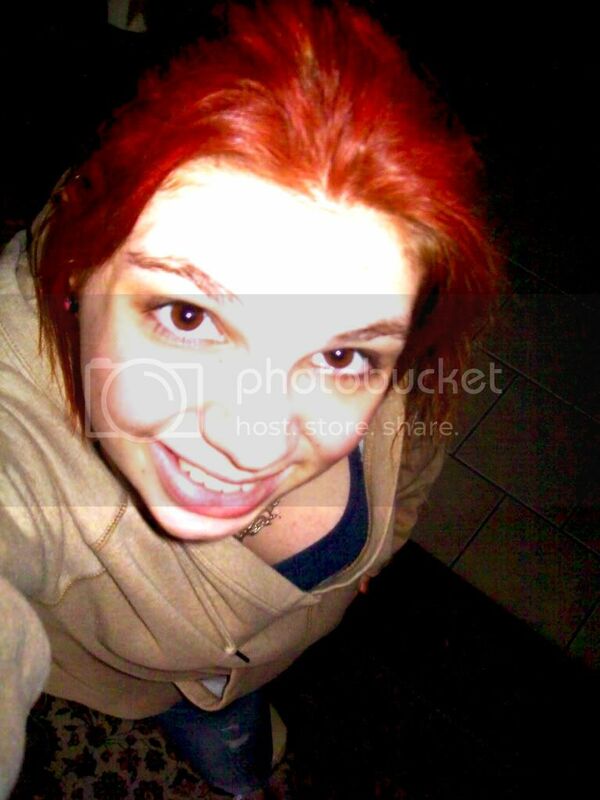 I know, I'm complaining about red but my hair was a neon, go figure. hah. Here's what that used to look like. Keeping your hair that bright is no easy task, but I had to keep it super healthy and I had a crazy amount of hair care products which I'll get into some other time. But to prevent myself from re-dying my roots every time they grew out a little, I had two go to products. This is the second product that I used, though to be honest, I only used it once as I was NOT impressed with it. It is literally spray paint for your hair. It even has the little mixer thing inside that you can hear when you shake it. I will admit that it is good for temporary use, as it says, but it can get very messy if you don't use it right. You shouldn't spray it directly onto your scalp either, as it does stain. It's brilliantly pigmented, but even after it dries, it gets on everything! If you do decide to use this, please be very careful, as it will stain your clothing. Rimmel London 60 Seconds - Red, Steady, Go! Believe it or not, this is my first red nail polish. I would have taken a picture as a sample, but it's just a basic red and everyone knows what that looks like. I randomly chose this one as I knew I just needed a red, so the fact that I picked up a quick drying polish was lucky. Not much to say on it as it's fairly basic, goes on easy, and dries well. Worth the money! As far as lips go, I'm very shy when it comes to lip sticks or glosses with a dramatic pigment. I need to work on that but sometimes I have very dry and chapped lips and some of the sticks and glosses I've tried accentuates that. Exfoliating my lips has been helping, but I'm still wary when it comes to actually buying a dependable lipstick. Does anyone have a good lipstick that they could recommend? First off, let's start with my car. I can't get it inspected until I get my front license plate replaced (thank you carriages at Kmart for slamming into it and allowing someone to steal it, by the way, that was cool). My payments for my car have been late, though I did make a payment last week, which might have just gone nowhere now. But I have come to learn today that the bank I have my car loan through have put an insurance claim out on my car, which means if I get pulled over in my car, they can impound it, which will cost a crazy amount, because you know how those places are. So I have to get that all settled on Monday because they don't take calls on the weekend. Okay. And this here is the biggest kicker. I've had my Macbook Pro for the last 3 years, no issues. Macs are good for that because they very rarely get viruses or anything like that. The other day it just decided that it didn't want to start. It would go to the loading page with the cute little apple and then... white screen. And then BLUE. SCREEN. Problem. This is when I decided I would take it to Apple so they could take a look at it. They looked at the inside and said everything looked fine and decided that they would like to run some tests on it, re-install the operating system. So this took about an hour and when I came back, they said that nothing they had done had worked and had discovered that the graphics chip was starting to go. Which would explain why I couldn't get to my desktop. BUT I HAVEN'T BACKED UP ANY OF MY FILES RECENTLY. Which is clearly an issue. The money I need to pay to get everything backed up and replaced is going to be a disgusting amount and need to save up, so I couldn't get my poor Mac fixed today. So I went out and bought a little chromebook and it's helping me through this hard time. Now I'm not here to complain about anything and say how hard my life is, because I know that there are others out there who have it rougher than I do. Maybe even someone reading this have been having it a lot worse for a long time. But it's very nice to vent and I have to keep reminding myself of something I saw on tumblr the other day. It was a quote that someone had posted on their facebook: "A year ago today I had no apartment, no job, and no car. Today I got the keys to my new house. Keep your head up, things will get better." Hopefully they do and I can only keep reminding myself of this as I grit my teeth through all this. 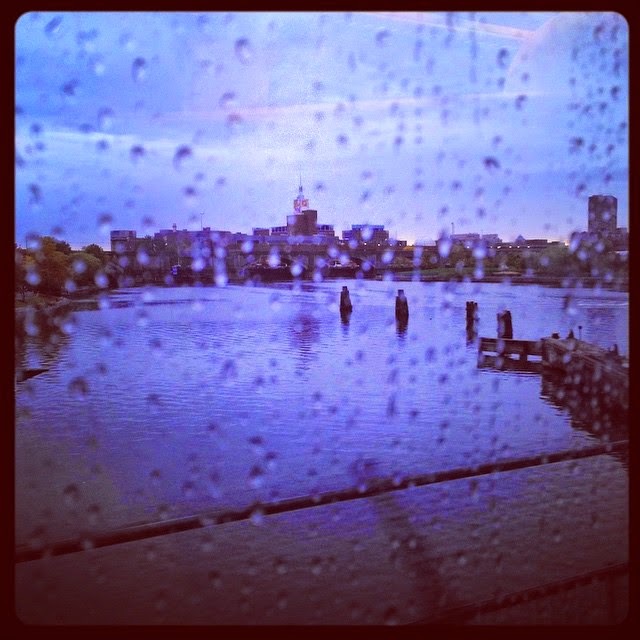 It felt like a Sunday as the train rolled in and out of North Station yesterday! The only way I got through the day at all was with a hot cocoa. Mmm. Typically I'll reach for a coffee but this winter feels like nothing but chocolate in liquid form.